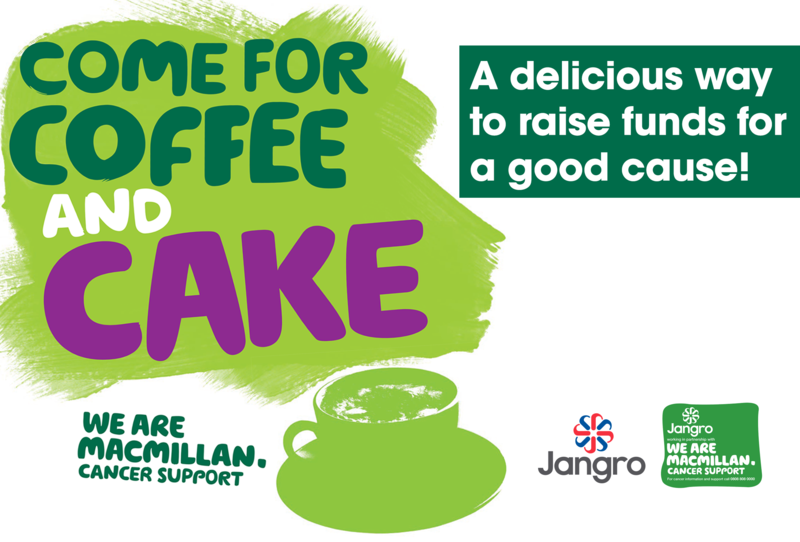 Once again, here at Jangro HQ, we are gearing up to taking part in MacMillan Cancer Support’s annual ‘World’s Biggest Coffee Morning’, helping to raise funds for this worthy charity. Jangro members, staff, suppliers, family and friends are all invited to join us on 28th September 2018 to catch up over a coffee and a slice of something delicious, whilst contributing to a great cause. Last year, our effort of baking and selling at this event raised £350 – a target we are hoping to smash this year, and bring us even closer to our fundraising goal of £100,000. Our current total stands at £64,440, and we’d like to say a big thank you to everyone who has helped us reach this phenomenal sum so far! Jangro members, suppliers and customers are truly awesome! Over the last year, our members have been busy participating in various fundraising events, such as sponsored Christmas walks, 100k cycle rides, mini-auctions, raffles and other events to raise money for MacMillan Cancer Support. The ‘Big Give Christmas Challenge’ raised an astonishing £5,516.89. We also repeated our ‘Supplier Round Robin’ event earlier this summer. Thanks to the generosity of the Jangro membership and our suppliers, we raised a total of £2,179 over this three day event. We are extremely proud to be partnering with Macmillan Cancer Support and helping a charity that does so much great work. Macmillan’s ambition is to reach and improve the lives of everyone living with cancer and to inspire millions of others to do the same. From the moment of diagnosis, through treatment and beyond, MacMillan is a constant source of support to people affected by cancer, including victims themselves, as well as carers, family members, volunteers and community members. Please click here to check on our progress and should you wish to donate, visit our Just Giving Page.